Home » Jean-Marie Collot d’Herbois. Jean-Marie Collot d’Herbois demolishing buildings of Lyon. French Revolution. 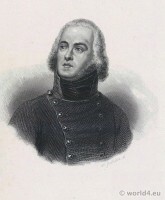 Jean-Marie Collot d’Herbois démolissant des bâtiments de Lyon. 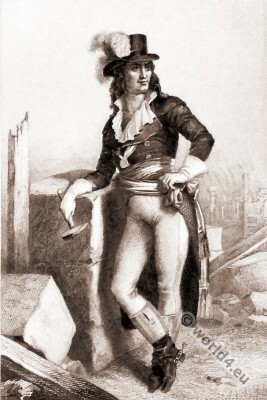 Jean-Marie Collot d’Herbois (1750-1796), French revolutionary, actor and director of the Lyon Theatre, member of the National Convention. He joined the Jacobin Club and was together with Billaud-Varenne the representative of the unofficial representative of the Parisian sans-culottes at Welfare Committee. 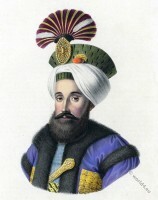 During the storming of the Tuileries Gardens and the September massacres, he played prominent role. He organized mass executions and destroyed Roman Catholic institutions in Lyon, voted for Louis XVI’s death, helped with the fall of Robespierre, was sentenced in 1795 for deportation to Guyana, where he died of yellow fever. Regency gown of salmon-colour. The Gallery of Fashion. 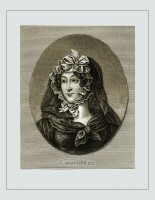 Louis-Lazare Hoche 1768-1797. French Revolution History. This entry was posted in 1792, 18th Century, Directoire, France and tagged French Directoire style, French Revolution Costume, Portrait on 8/30/15 by world4.